KAMMURI is moving W along the Chinese coastline towards northern Vietnam. 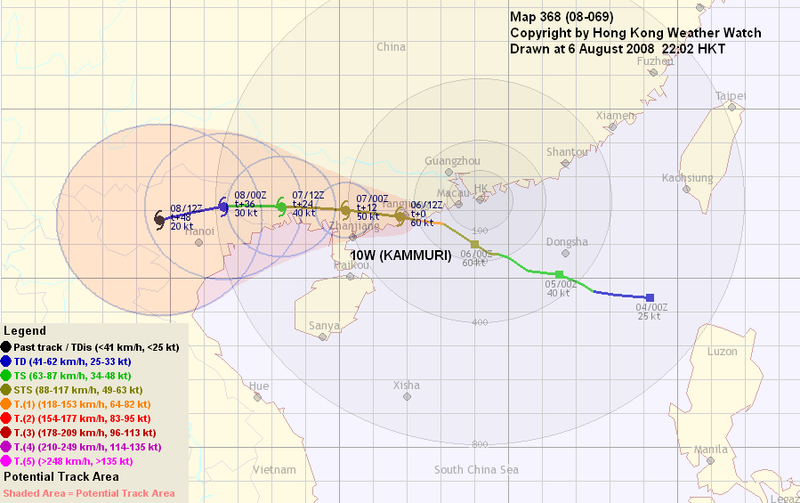 At 14 HKT, KAMMURI was centred about 600 km (320 NM) W of Hong Kong. All tropical cyclone signals were cancelled at 07:15 HKT today. It is expected that KAMMURI will track W to WSW along the southern periphery of the extending subtropical ridge anchored east of Korea. Due to lack of moisture, KAMMURI will weaken gradually and dissipate near t+36. This is the final bulletin on KAMMURI. 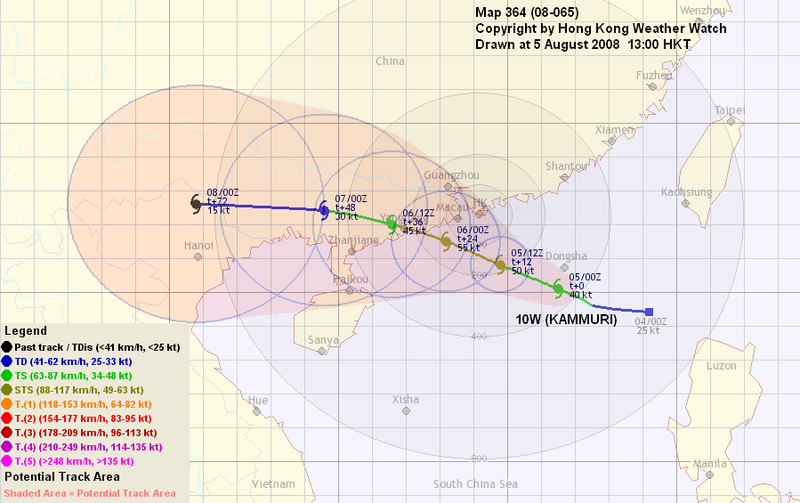 KAMMURI made landfall near Yangjiang near 20 HKT. 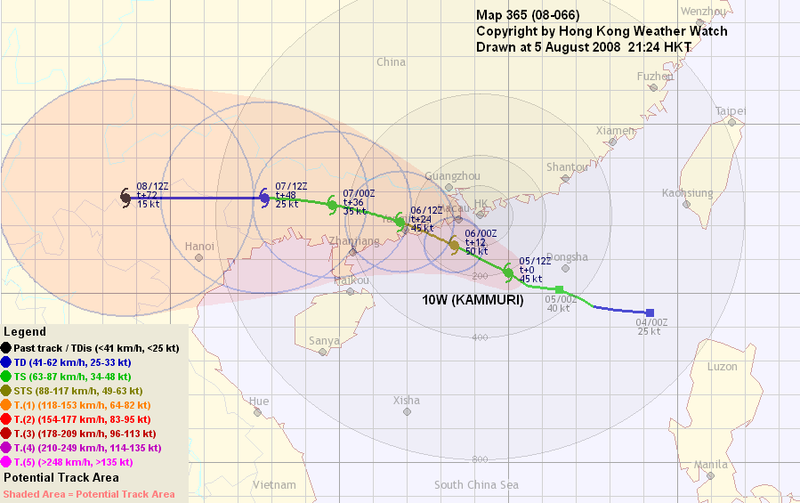 At 20 HKT, KAMMURI was centred about 250 km (140 NM) WSW of Hong Kong. The Observatory has issued the number 3 signal at 17:15 HKT. It is expected that KAMMURI will track W along the south to southwestern periphery of the extending subtropical ridge anchored in Korea. KAMMURI will weaken gradually and dissipate near t+48. Southeasterly winds will gradually subside in the next 12 to 24 hours. KAMMURI intensified into a typhoon and has been moving faster in the last 6 hours. At 14 HKT, KAMMURI was centred about 140 km (70 NM) SW of Hong Kong. The Observatory may issue the number 3 signal in the next few hours as KAMMURI is about to make landfall. It is expected that KAMMURI will track WNW then W along the southwestern periphery of the subtropical ridge anchored in Korea towards western Guangdong. KAMMURI should have attained maximum intensity by now, and interactions with land will weaken it from t+6. KAMMURI is making its closest point of approach to Hong Kong now. Strong to gale force winds are expected from the southeast in the next couple of hours, occasionally reaching storm force on high grounds and offshore waters. KAMMURI slowed down a bit last night, has consolidated and is edging closer to Hong Kong. It has also intensified into a severe tropical storm. 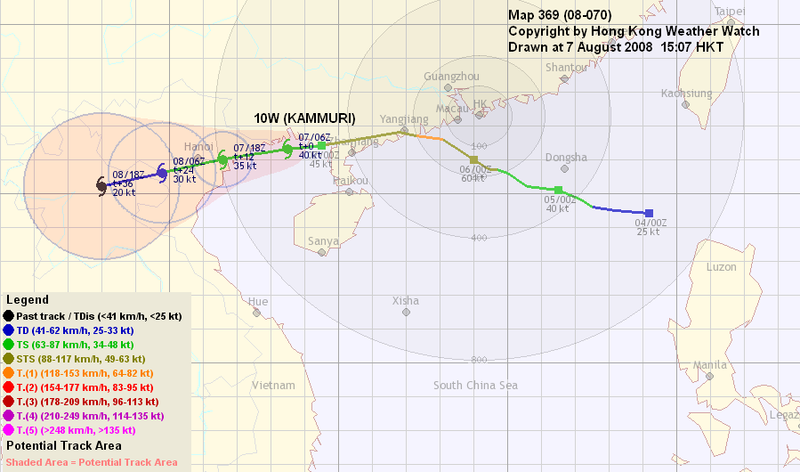 At 08 HKT, KAMMURI was centred about 150 km (80 NM) S of Hong Kong. The Observatory has issued the No. 8 NE Gale or Storm Signal at 05:40 HKT. It is expected that KAMMURI will track NW then WNW in the southwestern periphery of the subtropical ridge anchored in Yellow Sea towards Guangdong. KAMMURI has consolidated last night. It should intensify slightly in the next 12 hours as it is tracked in a generally favourable environment before landfall. Interactions with land will weaken KAMMURI from t+12. Gale force E/NE winds or above is blowing in Hong Kong now. 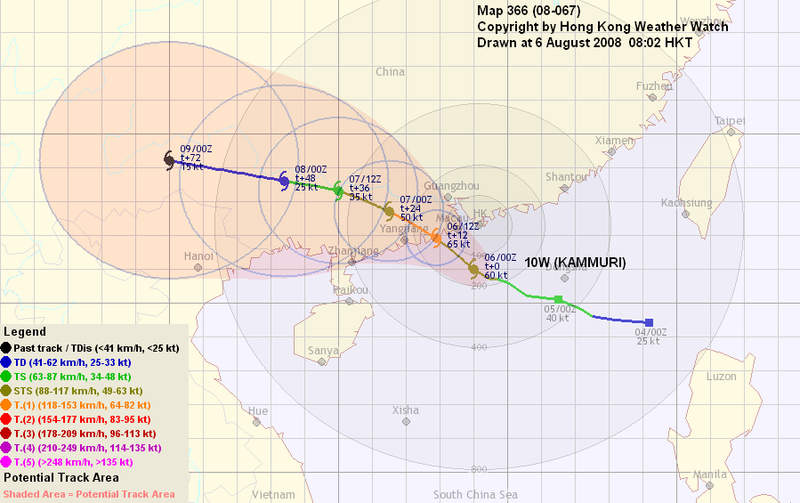 It is expected that KAMMURI will make its closest point of approach to Hong Kong near noon today. Winds are expected to stregthen and wind direction will rotate clockwise to southeasterlies later today as KAMMURI reaches SW of Hong Kong. Please beware of this change in wind direction and perform all necessary precautionary measures. KAMMURI moved WNW in the past 12 hours. At 20 HKT, KAMMURI was centred about 210 km (110 NM) SSE of Hong Kong. The Observatory has issued the Strong Wind Signal number 3 at 19:15 HKT, and is not ruling out the possibility of higher signals. An extension of the subtropical ridge anchored in the Yellow Sea can be seen north of KAMMURI. It is expected that KAMMURI will track WNW in the southwestern periphery of this ridge towards Guangdong. KAMMURI should intensify slightly in the next 12 hours as it is tracked in a generally favourable environment. Interactions with land will weaken KAMMURI from t+12. Winds is strengthening from the northeast now. It is expected that rain will become heavier overnight together with strong northeasterly winds, reaching gale force offshore. Wind direction will rotate clockwise to southeasterlies early tomorrow as KAMMURI reaches SW of Hong Kong. 10W was named KAMMURI by the JMA this morning, moving WNW in the past 12 hours. 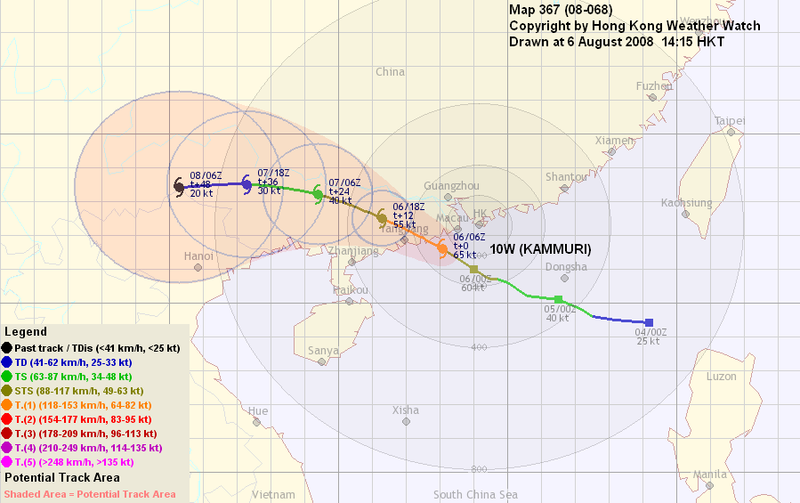 At 08 HKT, KAMMURI was centred about 340 km (190 NM) SE of Hong Kong. An extension of the subtropical ridge anchored in the Yellow Sea can be seen north of KAMMURI. It is expected that KAMMURI will track WNW in the southern to southwestern periphery of this ridge towards Guangdong. Shear has increased in the South China Sea in the past 12 hours. As sea surface temperature is still high, KAMMURI should be able to intensify near climatological rate in the next 24 hours. Interactions with land will weaken KAMMURI from t+24. Winds will strengthen from the northeast later today with rain becoming heavier gradually. Wind direction will rotate clockwise to southeasterlies tomorrow. 10W became better organized and has intensified into a tropical storm, moving west in the past 12 hours. 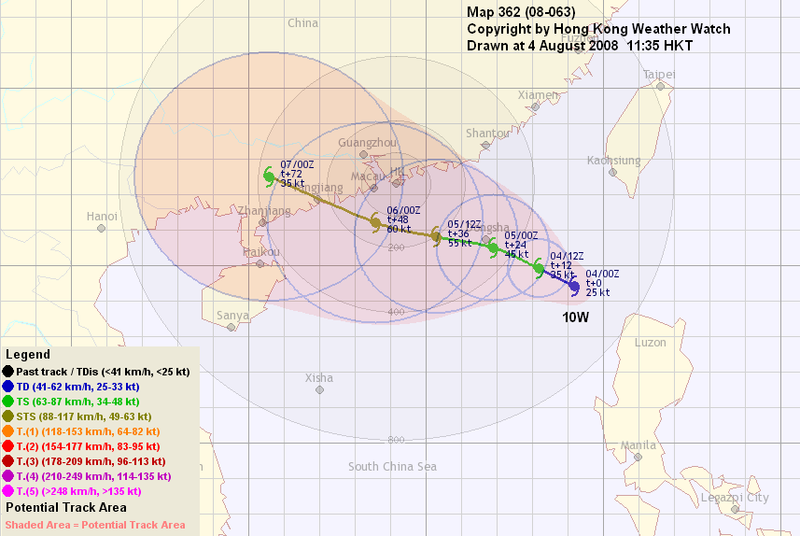 At 20 HKT, 10W was centred about 460 km (250 NM) SE of Hong Kong. The Observatory has issued the standby signal at 10:15 HKT today. An extension of the subtropical ridge anchored near Okinawa can be seen north of 10W. It is expected that 10W will track WNW in the southern periphery of this ridge towards Guangdong. Westward movement induced by 99W is expected to diminish as convections are being picked up by 10W. 10W's outflow is improving, shear is minimal and sea surface temperature is high in South China Sea. 10W should be able to intensify near or slightly faster than the climatological rate in the next 36 hours. Interactions with land will weaken 10W from t+48. As 10W strengthens and moves closer to Hong Kong, it is expected that 10W will start to affect Hong Kong tomorrow, with strengthening northeasterly winds changing to southeasterlies. Onset of rain is also expected later tomorrow. A disturbance (90W) north of Luzon intensified into a tropical depression this morning, and the JTWC has given it a temporary number of 10W. 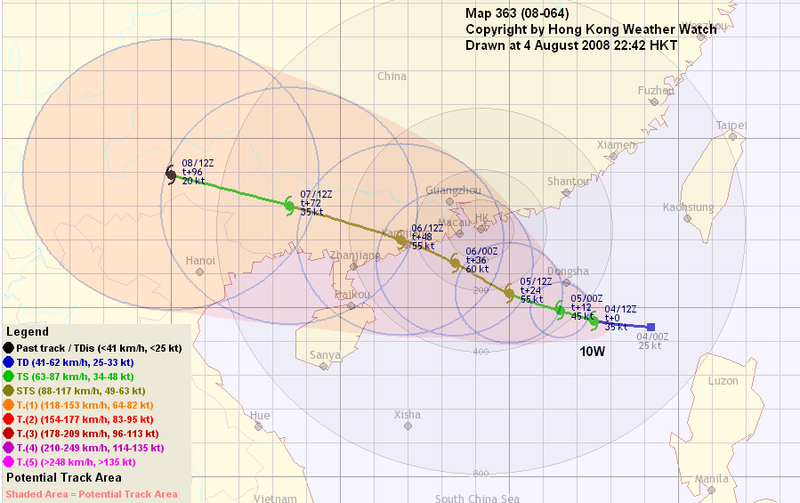 At 08 HKT, 10W was centred about 620 km (330 NM) ESE of Hong Kong. The Observatory has issued the standby signal at 10:15 HKT today. An extension of the subtropical ridge anchored near Okinawa can be seen north of 10W. It is expected that 10W will track WNW in the southern periphery of this ridge towards Guangdong. Westward movement is also induced by another disturbance, 99W, in the South China Sea. 10W's outflow is improving, shear is minimal and sea surface temperature is high in South China Sea. 10W should be able to intensify near or slightly faster than the climatological rate in the next 48 hours. Interactions with land will weaken 10W from t+60. Wind direction in Hong Kong changed from E to N today. It is expected that 10W will start to affect Hong Kong tomorrow, with strengthening northeasterly winds changing to southeasterlies. Onset of rain is also expected later tomorrow.